It’s almost time to switch the backpacks and lunchboxes for flip flops and picnics. Many parents are forgoing summer camps due to the economy, and although that provides some financial relief, the real dilemma is “What will I do with them all summer long?” To ensure kids aren’t giving you the “I’m bored” or “I don’t have anything to do” lines, engage them early in a pursuit that will last far beyond the dog days of summer. Is the cost of recreation leagues, expensive equipment or pricey camps beginning to creep into your spring and summer budget? How can you keep kids entertained, engaged and potentially even educated without draining precious financial resources? To tweet or not to tweet, that is the question. No, we’re not referring to micro blogging, we’re talking about birding. One of the most overlooked hobbies and sports in the U.S., birding will fascinate and engage family members of all ages, while secretly educating them. Unlike many hobbies that require expensive equipment, lavish participation fees or special training, birding requires very little of its participants. Two basic items will get you on your way to becoming an expert birder. Binoculars are the foundation of any birding experience. Although unaided eyesight can identify many species, binoculars allow for seeing birds at a great distance and for capturing the minute details (tail feathers, head shape) that often distinguish one bird from the next. Will you be searching for birds in heavily wooded areas? That calls for a wide range of vision that will let in more light. Or maybe you live in desert condition, where protected lens will help keep out dust and dirt. Different terrains can determine whether you need a larger field of vision or higher power. Binoculars are identified by two numbers. The first number is the power or magnification level and the second number is the size of the lens, which determines how much light it lets in. For example, a 7 x 25 set of binoculars means objects will appear seven times closer than normal and the field of vision is 25mm. Visit www.binoculars101.com to find out more and help you choose the right magnification and lens size or your birding adventure. Picking birds out of a line up can be quite challenging, especially for newcomers to the sport, whether young or old. A must for birders is a good field guide that will help you learn and identify birds. Different publishers (Petersons, Stokes and Kaufmans are all good purveyors) display content in various ways – pictures of birds versus illustrations, maps beside birds versus in an index. No approach is better than another, it just depends on what appeals to you. In addition to how information is presented, you can also select a guide by region, state, bird habitat or species. You can even get field guides tailored to backyard birders and those designed for children or beginning birders. Sunscreen is a good idea to take on all birding trips, no matter the season. But in warm weather, another precaution is necessary. Bird habitats, especially those full of trees, brush or water, tend to breed mosquitoes and other annoying insects. Insect repellent will become your best friend. You have to start somewhere. “Begin by making a list of all the birds you know and can identify,” said Freeman. “This will become your core list.” Perhaps you can identify the cardinal in the backyard or the hummingbird that appears at your feeder on a daily basis. Make a commitment to learn three or four at a time. Look for birds that are typical to the area where you and your children will be birding. You are helping your kids learn a new vocabulary so break it up into manageable parts – learn a few at a time. Learn the bird’s call at the same time you learn what it looks like. It helps with positive identification. So many birds live in wooded or brushy habitats, that especially during the summer when plants are in full bloom, it can be difficult to see them. That is why the sport is referred to as birding, not bird watching. There are also secretive birds, like the Swainson’s warbler. Because they live among the brush, they are often hidden from view. Education in birding goes way beyond identification and call recognition. Birds teach us about aerodynamics (did you know they have hollow bones to make flying easier? ), physiology (one of the highest metabolisms in the animal kingdom), meteorology (they ride with the weather fronts) and ecology (migration) just to name a few. Teach your children to look at the bird itself to find clues about its lifestyle. The shape of the beak is a clue to what they eat. Seed feeders have a short beak to crack open seeds. Shore birds tend to have long, thin beaks to stick into the mud to find food. Nectar-feeding birds like the hummingbird have tiny beaks to poke into the flower for nectar. Birds, like humans, have varying diets. Some birds eat only seeds, some eat only berries or plants. Birds of prey are carnivores. And then there are some species that are both herbivores (plant eating) and carnivores (meat eating). What they eat tells you where you will find them in the landscape – in the treetops, among the brush or at the shoreline. If your backyard isn’t bird friendly or if you would rather explore somewhere a little less familiar, look to regional resources for locations and assistance in developing your hobby. National Wildlife Refuges www.fws.gov/refuges are excellent bird habitats, and they have skilled staffers to help you get started. Many even hold free birding classes. Another great resource is the National Park Service www.nps.gov. 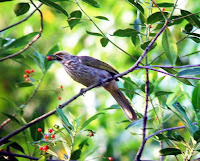 For more information, visit www.visitchesapeake.com/whattodo/birding/ or call the Chesapeake, Va., Conventions & Tourism tool-free at 888-889-5551. Based in southeast Virginia, the city of Chesapeake boasts more than 4,000 available hotel rooms and some of the strongest attractions, accommodations and meeting spaces in the area. Chesapeake Conventions & Tourism (CCT) strives to promote, market and sell the city as a destination for meetings, conventions and individual travelers, fostering economic development and benefiting and supporting members and the overall business community. Because of its location and highway network, Chesapeake provides easy access to several other cities in the Tidewater region including Virginia Beach, Norfolk and Williamsburg, all of which are less than an hour away. The City of Chesapeake is home to several stops along the Civil War Trail and its Great Dismal Swamp is nationally recognized as a stop on the historical Underground Railroad. In addition to rich history, Chesapeake is home to the Great Dismal Swamp National Wildlife Refuge and hosts a thriving outdoor community with thousands of unspoiled acres for kayaking, birding and fishing. Chesapeake is a part of the statewide Virginia Green program which aims to reduce the environmental impact of the tourism industry. Chesapeake is also rated by the FBI as one of the top five safest cities of its size in the U.S., and Money magazine proclaimed it as one of the six best places in America to live. For more information on Chesapeake Conventions & Tourism, visit www.visitchesapeake.com. We have started bird watching especially because a pair of bald eagles are nesting close by. It is a great family activity and causes much discussion trying to identify the birds.